On the importance of studying and reflecting on Our Lady's apparitions. On Our Lady of Quito and Archbishop Lefebvre's words on the apparition. The alleged apparitions at Medjugorje remain a source of strife and controversy in the Church. A study of the life and work of Richard Crashaw on Our Lady. A friendly debate on Our Lady of La Salette. A study of the Collect in the Traditional Latin Mass. A historical study of the first Masses offered in Australia. A reflection on the kingdom of the soul. 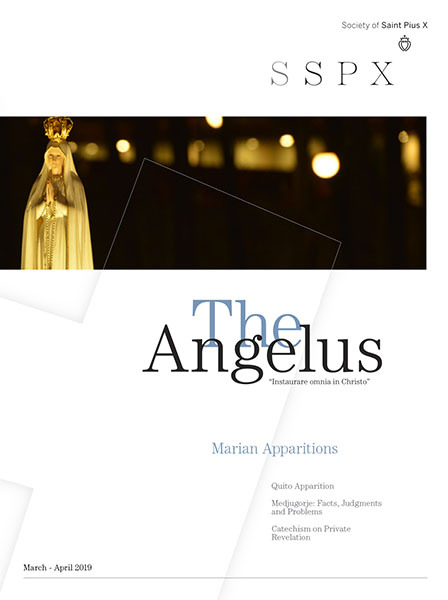 A critical study of Marian apparitions among the Eastern Orthodox. The family meal is crucial, and this is why. A walk through the marvel that is Notre-Dame de la Garde. Questions and answers on blasphemy, spirituality, and Our Lady. A detailed critique of 20th century Catholic philosopher Jacques Maritain. Our trouble today is ignorance of the supernatural.